Amyloid neuropathy is a syndrome of peripheral nerve degeneration associated with deposition of amyloid attributed to various molecular compositions including (1) monoclonal protein of immunoglobulin light chain (AL amyloidosis) and (2) misfolded proteins produced by amyloid-prone genes, in particular, familial amyloid polyneuropathy (FAP) due to transthyretin (TTR) mutations. During the early stage of amyloid neuropathy, small fiber of the nociceptive type is frequently affected. Neuropathy of AL amyloidosis is a chronic hematological disorder. In addition to peripheral nerves, the kidney, liver, and heart are major organs of amyloid deposition resulting in diverse clinical presentations. In AL amyloidosis, progressive polyneuropathy is the most common neurological manifestations while mononeuropathy multiplex is also documented depending on the distribution of amyloid pathology. Since AL amyloidosis is due to B-cell dyscrasia, treatments include (1) a combination of prednisolone and chemotherapy (melphalan) and (2) target therapy of proteasome inhibitor (e.g., bortezomib). TTR-FAP is the most common genotype of FAP compared with other amyloid-producing genes (gelsolin and apolipoprotein A1). There are more than 100 mutations of TTR with variations in geographic and ethnic distributions. For example, V30M is the most common genotype and endemic in certain areas of Portugal and Japan. Small-fiber neuropathy is usually the initial presentation of FAP, including neuropathic pain, loss of protective sensation, and autonomic dysfunctions. 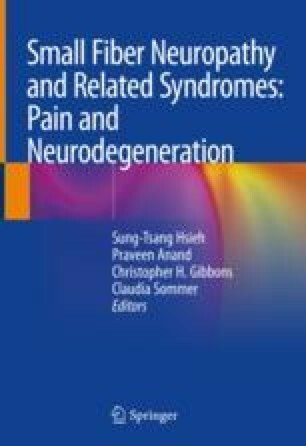 Neurological deficits progress to affect large fibers leading to weakness of four limbs and unsteadiness, and many patients became ambulation-dependent or bedridden within a decade depending on the genotypes. In addition to liver transplantation which eliminates the major source of TTR-producing organ, new treatments have emerged that may slow the progression of neurological deficits; these include TTR stabilizers and RNA-based therapies. Hence to identify early biomarkers is the direction of research for slowing disease progression of FAP.